President Kennedy was well-known to the Baby-Boom generation and to the Silent Generation that preceded it. A man born to wealth, who suffered repeated, debilitating illnesses, who served his nation first as a navy hero in WWII, then as congressman, senator and ultimately, president. He was an inspirational leader — and one who, of course, had his detractors. But who was this man, what were the experiences that developed his character, what were the values he cherished, and what did he want for his country? “IN SOME WAYS, KENNEDY’S LEGACY IS MUCH THE SAME AS THE LEGACY OF A TEACHER. The best teachers are the ones you remember half a century after you left their classrooms. The ones who set your brain, your heart, your gut on fire with the richness of possibility. But there’s more than that, because that alone is insufficient to elevate John Kennedy to the heights to which ordinary citizens have raised him, historian objectivity notwithstanding. What really entitles Kennedy’s fans (that’s the right word) to their high opinion of him? “In 1963, when Amherst College invited the President to speak at a convocation honoring the memory of Robert Frost, one would have understood it to be not only an advantageous choice (after all, what school would not benefit from the prestige of having a President on campus) but a proper choice: one could easily believe that John Kennedy was personally familiar with Frost’s poetry and probably that of a good many other poets, too. He was clearly, as his Amherst speech, reproduced elsewhere in this volume, made clear, a literary man. “He had written a first-rate senior thesis at Harvard (“Why England Slept”, which later became a best-selling book). Even though his friend and assistant Ted Sorensen and Georgetown Professor Jules Davids did a good deal of the actual research and writing, it was Kennedy who conceived of and oversaw the publication of Profiles in Courage, a book that celebrated examples of political leaders willing to put their careers at risk to do what they thought was right. “IT WAS AN UNFORTUNATE FACT OF HISTORY, therefore, that the Soviet Union had launched an aggressive and potentially threatening space program during the Eisenhower and Kennedy presidencies. Kennedy met the challenge by establishing America’s own space agency and proclaiming the conquest and exploration of space a national priority. That decision led to some of this country’s most exciting and important achievements. But to meet the new challenge, Kennedy recognized that the United States would have to simultaneously beef up its production of mathematicians, engineers, and scientists. The end result was a changed focus for America’s colleges and universities, away from the liberal arts, away from the humanities, away from civics and literature and critical thinking, away from the very qualities which Kennedy singled out for their importance in his Amherst speech. That decision—necessary and wise at the time—has had the unfortunate effect of an education system that produces fewer John Kennedys and in the process subtly changed the qualities Americans insist upon in national leaders. Our move from the soft sciences to the hard sciences has had effects Kennedy might find dispiriting. Kennedy’s Amherst speech celebrated the arts, the great animating spirit of novels and poetry and painting and sculpting, those cultural animators of what is most human in us. But that was not its only message. This was, after all, the man who in the short time of his presidency launched the Peace Corps and repeatedly promoted the qualities of outreach and growth, of inclusion and peaceful co-existence. America’s strength was mobilized to promote international development and opportunity. “To be clear, there was a calculating strategic dimension to all of this—the United States and the Soviet Union were competing for the loyalties, or at least the friendship, of other nations. In Asia, China was doing the same thing. Some worried that communism was on the march and there was truth to the fear that it had significant appeal in nations where life was difficult. One of the less praiseworthy results of the Kennedy presidency was the extent to which the President’s “best and brightest” advisors, largely academics who had not served in elective office, bought into the fear and pushed for what became a disastrous involvement in Vietnam. No presidency is without its failures; this was Kennedy’s. And it, too, is a contributor to his legacy. “In trying to assess a singular presidency, there are complexities. Clearly the Kennedy presidency had its grand moments and its less successful undertakings. But those few years did shed some light on the qualities one should seek when selecting a man or woman to exercise the immense power resident in the presidency of the United States. Here we turn to the Cuban missile crisis. “The missile crisis is a historical footnote today but at the time it was a moment when the fate of nations and the lives of millions hung in the balance. “Having discovered proof that the Soviet Union had placed missiles in Cuba, where they could easily reach the United States, only 90 miles away, Kennedy’s top advisors (those “best and brightest” whose advice on Vietnam was so disastrous) urged the President to fire away, blasting the Soviet missiles in their launch pads. It was one of those times when we are reminded that disastrous results can flow from a President of unsteady temperament and injudicious evaluation. Kennedy’s greatest moment came not from his “bold” attack on a powerful enemy but from his steadiness. A naval blockade, warnings, and negotiation (the U.S. quietly withdrew some of its own missiles from Europe) led to the USSR packing up its missiles and taking them home. It was a critical test for Kennedy; he was young, relatively inexperienced, and, in the eyes of Soviet leaders, likely to be easily bullied. It was vital, for the moment and for his presidency, for him to demonstrate that he, and therefore the United States, would not be pushed around while he was in the White House. It was a moment when John F. Kennedy had to demonstrate strength and resolve. He did, but by doing it in his own way, he showed what we really need in a President: a person of calm, steady temperament; a person who is thoughtful in seeking and weighing alternatives; a person sufficiently at home in his own skin to stand up to bullies abroad and unwise advice at home. That—setting a model for the kind of person we need in a moment of crisis—is Kennedy’s greatest legacy. – Mickey Edwards, Vice President and Program Director, Rodel Fellowships in Public Leadership at the Aspen Institute, former U.S. Congressman and former chairman of the American Conservative Union. “He thought that American nationalism was defined, not just by space or by winning the Cold War, but by making fertile ground for the creative minds of America to take root. “He had been a writer for the Hearst newspapers and he cared about words and the way words conveyed meaning more than most presidents… Frost became kind of a symbol of the land of America .. his poems were eternal. “For Kennedy, this combination of poetry and power defined who he was. He would do big, bold brazen things like the Peace Corps. We’re going to send a man to the moon by the end of the decade, the showdown of the Cuban Missile Crisis, the Berlin Wall. And yet, whenever he moved things, used power, he did it with poetry, the poetry of oratory. 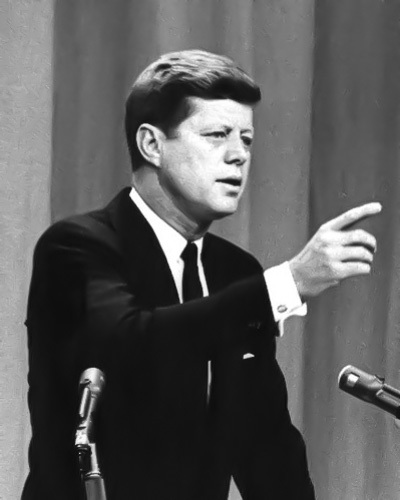 “… I think it’s one of Kennedy’s best speeches. It’s an unusual speech because he’s speaking from the heart directly to those students at Amherst. This was a speech meant for global consumption. It was a human being talking to students. And in that regard, I think it’s a very special vintage of Kennedy’s speeches, because you can see a side to him that we don’t always see. “The key to John Kennedy is he reads so much, and he wanted to be a writer. He won a Pulitzer Prize for Profiles in Courage. He wrote his senior thesis at Harvard Why England Slept. When you write, you learn to respect other writers. And when you read Frost, you can find how he creates imagery and words, and how he moves people, that becomes unforgettable. 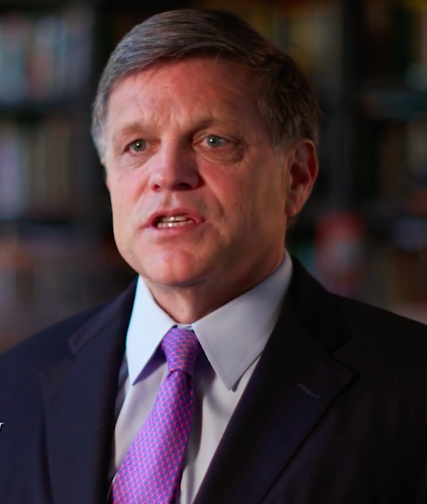 Click the arrow above to view video excerpt from interview of Douglas Brinkley. “IN KENNEDY’S SPEECH AT AMHERST COLLEGE he acknowledged and honored its graduates who had lead lives devoted to public service. He called on those who were privileged to have a fine education to recognize their responsibility to those who were less fortunate in American society, and then around the world. He saw young people, their enthusiasm and their commitment as one source of national strength. “He acknowledged, of course, Robert Frost as an artist who had connections to Amherst, and the artist as someone who could turn a critical eye on the society as a whole. He also saw this to be a source of national strength. Artists had an obligation within a democratic society to question the institutions of government, the organization of society, and how power was wielded. In some sense Kennedy was celebrating the notion of dissidence and it speaks to his enormous self-confidence. “He also celebrated the role of the press, even though he wasn’t always happy with the press. He often endorsed the importance of having an adversarial press, and even said that it was an advantage to him — something that Soviet Premier Khrushchev did not have in a totalitarian state. “He joined the concepts of power, education, and art saying that the exercise of power is enhanced by an understanding and appreciation of the arts and the role of the artist as on outsider, whose criticism can help us to be more responsible and more responsive to the conditions that he hoped young people would devote their lives to improving. “President Kennedy repeatedly called upon young people to devote themselves to public service. In some sense he saw his own life as having been the fulfillment of that. He entered the Second World War and sought deployment in the Pacific. He could have remained state side. 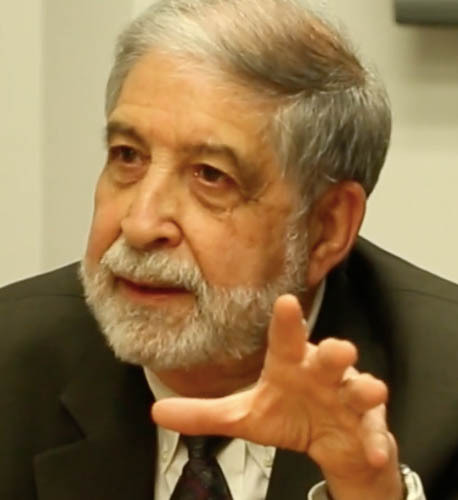 After the war, he could have done any number of things professionally, but he sought to go into politics as a way of becoming engaged in public service. “He thought that that was the most rewarding life that one could live — one in which you gave back. You did something bigger than yourself. You gave back some of what you had been given really by the accident of birth. And so the great privileges that he enjoyed and that had given him his head start in life he thought carried with them responsibility. That was a theme he reiterated very, very often. KENNEDY AND HIS MESSAGE WERE MUCH BIGGER THAN KENNEDY THE PERSON OR THE PRESIDENT. “… HE WAS ABLE TO TAP INTO A STRAIN OF IDEALISM IN THE AMERICAN CHARACTER and in the society at that moment in time that was extremely powerful … his death was very devastating to the spirits of those who lived through it, and I think in some sense the country has never really been quite the same. 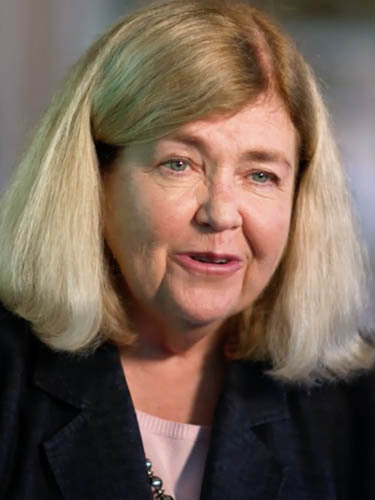 Click the arrow above to view video excerpt from interview of Ellen Fitzpatrick. 1 Mickey Edwards, “The Personal Presidency: John F. Kennedy’s Legacy,”. JFK: The Last Speech, Mascot Books, 2018. 3 Douglas Brinkley, Interview September 2017. Courtesy of Northern Light Productions. 4 Ellen Fitzpatrick, Interview May 2017. Courtesy of Northern Light Productions. President Kennedy at his first press conference at the State Department Auditorium, January 25, 1961. Photo by Abbie Rowe. White House Photographs. John F. Kennedy Presidential Library and Museum, Boston. Mickey Edwards in conversation with members of Amherst ’64. Photo copyright Reunion ’64, Inc.
Douglas Brinkley photo courtesy of Northern Light Productions. Ellen Fitzpatrick photo courtesy of Northern Light Productions. © Copyright 2018. Reunion '64, Inc. All rights Reserved.